"These are so easy to make and addictive to eat! They are a hit with all my friends, some of whom just eat them without any dip. They are great on their own or with dessert hummus. Try them with my recipe for Pumpkin Pie Dessert Hummus; you won't be disappointed." Cut each pita bread into 8 wedges and brush with olive oil. 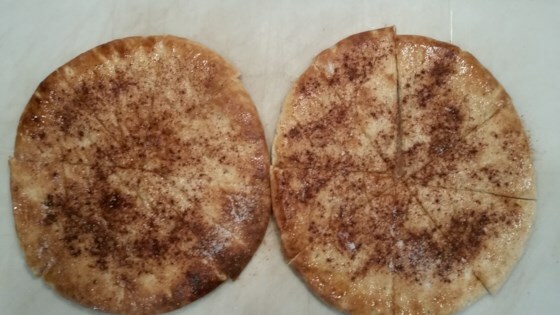 Sprinkle cinnamon and sugar on top and place wedges on a baking sheet. Bake in the preheated oven until crispy on the edges and slightly soft in the middle, 12 to 14 minutes; they will harden as they cool. Serve immediately or store in an airtight container after cooling. Homemade pita chips have a warm, crunchy snap you just can’t get from the bag.